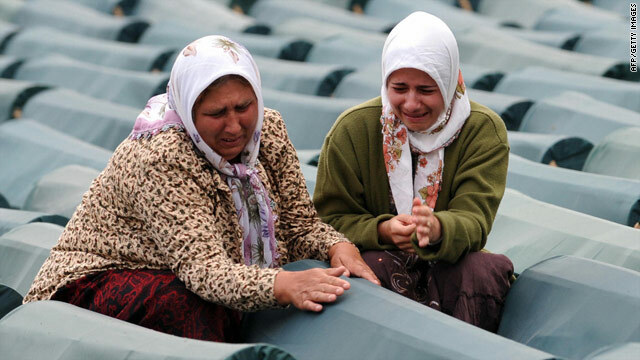 Bosnian Muslim women weep among coffins displayed at the memorial center of Potocari near Srebrenica. Court of Appeal at The Hague rules that group of Bosnian women cannot sue U.N.
7,000 Bosnian Muslim men, boys were killed when Serb troops overran U.N. "safe area"
(CNN) -- The Serbian Parliament has officially condemned the 1995 massacre of thousands of Muslim men and boys in the Bosnian town of Srebrenica. The resolution was approved by a narrow majority, with 127 out of 250 lawmakers voting in favor of issuing an apology to victims. More than 7,000 Bosnian Muslim men and boys were killed at Srebrenica when Bosnian Serb troops supported by Belgrade overran a United Nations "safe area" in July 1995. It was the worst European massacre since World War II. The U.N. War Crimes Tribunal called the five-day slaughter "the triumph of evil." A statement on the Web site of the Serbian government read: "The Srebrenica Declaration sharply condemns the crime committed against the Bosnian population in Srebrenica in July 1995, expresses condolences to families of victims and extends apologies to them for lack of measures that could have prevented the tragedy. "The Serbian Parliament offers full support to state organs responsible for processing war crimes and for the successful conclusion of cooperation with the Hague tribunal." It added that arrest of Ratko Mladic, the former Bosnian Serb army commander, was "extremely important." Mladic is the most senior fugitive still at large. The declaration also called on all former Yugoslav republics to condemn crimes committed against Serbs in a similar manner. Democratic Party MP, Nada Kolundzija, told Serbia's B92 network that "once the resolution is adopted, a tragic chapter in recent history will be closed and a new perspective will be opened for the new generations." She added that Serbia "will have its international credibility and image restored." Earlier Tuesday, the Court of Appeal at The Hague ruled that a group of women cannot sue the U.N. for failing to prevent the massacre. The court said it was impossible for the Mothers of Srebrenica to sue because of the immunity granted to the United Nations under international conventions. It said the women have other avenues to try to recover their losses. The mothers are surviving relatives of the men and boys who died in the massacre. They wanted to sue because they believe the Netherlands and the United Nations failed to prevent the killings, the court said Tuesday. They allege it was the Dutch U.N. peacekeepers who were to blame, the court said. In making its decision, the court said it tried to balance the U.N. immunity with the interests of the women. "The Court of Appeal appreciates that the mothers and their relatives have suffered atrocities," the court said. "The Court of Appeal therefore comprehends entirely that they seek redress for their losses in a court of law. It ruled, however, that the interests of the U.N. must prevail in this case." Lawyers for the women could decide to appeal to the European Court of Human Rights. Former Bosnian Serb leader Radovan Karadzic is currently on trial at the U.N.'s international tribunal at The Hague to defend himself against genocide charges stemming from the 1992-1995 Bosnian conflict. Karadzic, who faces 11 charges of war crimes, crimes against humanity, and genocide during the war, recently told the tribunal the Serb cause was "just and holy," and dismissed as myths two of the worst atrocities of a conflict that claimed 100,000 lives -- the three-year siege of Sarajevo and the Srebrenica massacre.